PHILLIPS STATION, Calif. -- California is rapidly plunging back into drought, with severe conditions now existing in Santa Barbara, Ventura and Los Angeles counties - home to one-fourth of the state's population, a national drought monitor said Thursday. The weekly report released by the U.S. Drought Monitor, a project of government agencies and other partners, also shows 44 percent of the state is now considered to be in a moderate drought. It's a dramatic jump from just last week, when the figure was 13 percent. 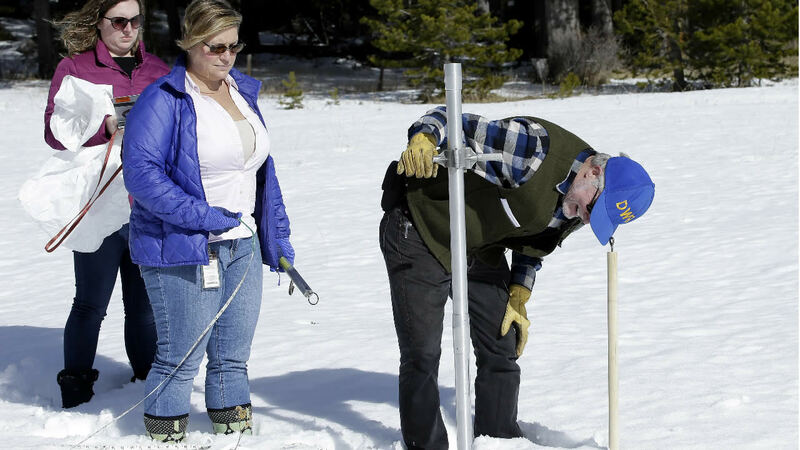 "It's not nearly where we'd like to be," Frank Gehrke, a state official, acknowledged after separately carrying out manual measurements of winter snowfall in the Sierra Nevada mountains, which supplies water to millions of Californians in a good, wet year. Overall, the vital snowpack Thursday stood at less than a third of normal for the date. California lifted a drought state of emergency less than a year ago, ending cutbacks that at the peak of the drought mandated 25 percent conservation by cities and towns, devastated generations of native salmon and other wildlife, made household wells run dry in the state's middle, and compelled farmers to dig deep, costly wells. A rainy winter last year in the state's north finally snapped the worst of that drought. The new figures from national drought monitors came amid growing concern among state officials about another dry winter. The dry spell is acute in Southern California. Los Angeles and some surrounding areas have received only one significant storm in nearly a year, and it triggered deadly mudslides. The region is now seeing record-setting heat. The readings detailed Thursday show the drought has worsened to the severe category in 5 percent of the state. The last time even a small part of the state was rated in severe drought was last year. However, Thursday's figures were far better than those during the peak of the state's epic dry spell, when 99.9 percent of California was in some stage of drought, and nearly half in the highest category. But the drought never really seemed to lift in some Southern California areas, Daniel Swain, a climate scientist at University of California, Los Angeles, noted this week. In Ventura and Santa Barbara counties, the lack of rain and dry vegetation were perfect fuel for a December wildfire that grew to become the largest recorded in state history. When it finally rained, the scorched earth turned into mudslides that sent earth, water and boulders roaring through neighborhoods. In California's Central Valley, the nation's richest agricultural producer, government officials had to install water systems during and after the five-year drought for small towns such as East Porterville after household wells ran dry. Even so, deliveries of bottled water continued this week to people outside East Porterville, said resident Elva Beltran, one of many volunteers who helped neighbors without water. "it never ended," she said of the drought in her area. California's water managers trekked to the mountains on Thursday to check the snow depth - one gauge of the state water supply. Electronic sensors showed statewide snow levels at 27 percent of normal. A bright spot, said Doug Carlson, spokesman for the state's Department of Water Resources, which carries out the snowpack surveys, was that reservoirs remain far fuller than usual thanks to last year's rain in the state's north. Click here for more videos and stories about snow.